Date/Time: Thursday, 20 April 2017, 14.40 pm. Abstract: In this talk, we consider a general class of nonlocal nonlinear wave equation arising in one-dimensional nonlocal elasticity. The model involves a convolution operator with a general kernel function whose Fourier transform is nonnegative. 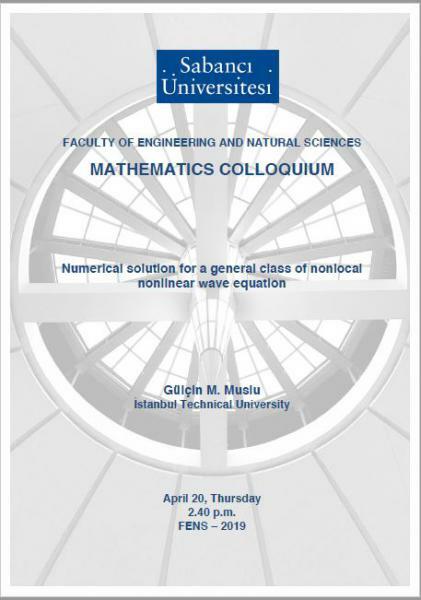 We propose a Fourier collocation numerical method for the nonlocal nonlinear wave equation. We first test our scheme for some examples of nonlocal nonlinear wave equation, such as generalized improved Boussinesq equation and the higher-order Boussinesq equation which arise from the suitable choices of the kernel function. We prove the convergence of the semi-discrete schemes in an appropriate energy spaces. We consider three test problems concerning the propagation of a single solitary wave, the interaction of two solitary waves and a solution that blows-up in finite time. We then extend our convergence proofs to the nonlocal nonlinear wave equation including more general kernels. To understand the structural properties of the solutions of nonlocal nonlinear wave equation, we present some numerical results illustrating the effects of the kernel function on the solutions. This is a joint work with H. Borluk and G. Topkarci. This work has been supported by the Scientific and Technological Research Council of Turkey (TUBITAK) under the project MFAG-113F114.